After this Summer, trundling over a single-lane, wooden-decked bridge on our way to the beach is an experience that we soon may not encounter ever again on our annual travels to the Atlantic Ocean. The Sunset Beach Swing Bridge, the last of its kind, will soon be replaced. Build in 1961, it is said to be the only large-capacity, steel, swing span bridge remaining on the East Coast. The center segment of the Sunset Beach Swing bridge floats on pontoons so that it can be opened to allow the passage of boats. Consequently, the bridge rises and falls with the tides, gently but firmly subjecting human plans to the dictates of nature on a regular basis, as extremes of high and low tides periodically force the bridge to close to traffic for short periods of time. Some credit the bridge for the unspoiled, village-like atmosphere of the island beach at Sunset, reasoning this compromised access essentially kept it an island for longer by slowing the pace of development over the years, preserving the charm of a North Carolina coastal village. I remember my first visit to Sunset Beach, and the comparative lack of tall buildings crowded along its dunes was an unexpected delight. I have read that the town of Sunset Beach was due for a new bridge over 20 years ago, but movement on this was slowed enough by the efforts of a group of residents who opposed it so that the funding for the bridge was lost, and Ocean Isle Beach was awarded the new bridge instead. 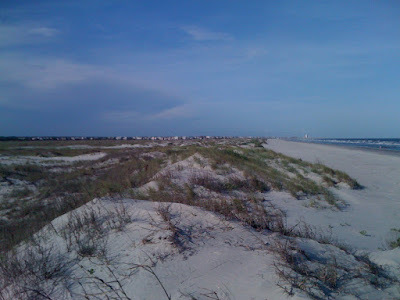 Of course, I don't purport to be an expert on the whole affair, but speaking as a newcomer to Sunset Beach, if winning the new bridge back in the 80's made it possible for that ugly high-rise on Ocean Isle beach to be built, then I am happy that similar progress at Sunset was delayed for so long. Hopefully by now, existing zoning and prevailing good sense will prevent a repeat of the mistakes of the past and spare us the ugly over development that spoils other coastlines. Anyway, construction began on the new bridge at Sunset Beach in 2008 and is nearing completion, reportedly due to open the summer of 2010. Each time my family slowly drives over the old bridge, we are treated to a good long look at the remarkable progress of the new one - which, like the others at Ocean Isle Beach and Holden Beach, will rise 65 feet above the water. The summer is ending, and with it may be your last chance to say goodbye to that old wood and steel bridge. My husband and I decided to kill a few hours prior to our dinner reservations with walk along Sunset Beach. The pleasure of this beautiful place inspired us to head towards the South Carolina border and cover as much as we could of Bird Island before we got tired. The broad and flat expanse of sand and the interesting creatures we kept spotting in the dunes beckoned us on and on for miles. We passed one or two lone cyclists spinning easily along, presumably returning from a quick trip to the border. It was quite a while before we got tired enough to turn back. Bird Island is a perfect illustration of the dynamic nature of North Carolina barrier islands, by virtue of the fact that it actually is no longer a separate island. Only as far back as the 1990's, Bird Island was separated from Sunset Beach by a tidal creek so you could only walk onto it at low tide. However, hurricanes and other factors pushed along the constantly-moving sands, filling in the creek and merging the islands of Sunset Beach and Bird Island into one. 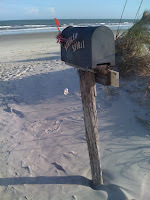 Some ways further down the beach, we spotted the famed Kindred Spirits mailbox that we had read about online. It is indeed filled with a large collection of notebooks and journals, and a good supply of writing instruments, and so we paid our respects by reading a few entries left by those who had gone before us. 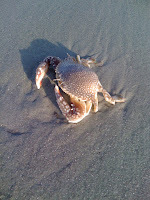 An inquisitive crab kept popping out of his little hold in the dunes under a nearby bench to check on our progress. While there, we turned to look back and were able to view the town of Sunset Beach in the distance. Seeing it so compact and low-lying, tucked in behind the dune line, made it easy to imagine it again as a quaint little fishing village, blissfully isolated from the frenetic and often cynical modern world from which we all come. Hard not to develop an affection for the place, even for us newcomers. As we started our return, the setting sun warmed our backs (This beach does run in a South SouthWest direction, after all.) 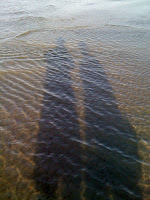 and we followed our shadows back to the pier. Well, I now have an opinion to add to the following debate: Which is better, charcoal or gas grilling? I vote charcoal! During our last stay at our condo in Sunset Village, we grilled out quite a few times; and I really can't remember the last time my steak tasted so good!! We have a gas grill at home, and it's been years since we cooked over charcoal briquettes. I'm seriously considering switching back to them at home. 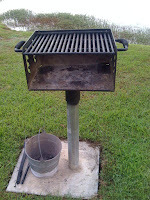 At Sunset Village, there are shared charcoal grills available for residents and their guests to use. Several are available near the picnic tables and around the lagoons, near the tennis courts and one of the pools, and two of them are right near our building. You probably can't tell so well from the photograph attached to this posting, but you are right by the water so you can watch the wildlife (turtles, wading birds, fish - and the occasional alligator) while you cook! We also enjoyed watching the rather exciting spectacle of my father-in-law and daughter catching a fish (see earlier post). The grills are each supplied with a bucket in which to scoop the ashes when you're done, and we keep a set of grilling implements and a lighter in our outdoor storage closet for our guests (one less thing to have to remember to throw in the luggage), as well as folding chairs. So, close your eyes and imagine the fragrance of food cooking on the hibachi - a memory awakened back from your childhood, perhaps! 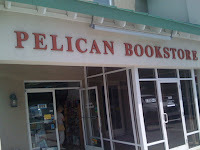 One more great way to while away the hours of your Sunset Beach Vacation! We've been back from our vacation at our condo in lovely, peaceful Sunset Beach only a few weeks, but I am just itching to go back. There were so many different things to do, I'm afraid we only scratched the surface. One of the places we did visit was Ripley's Aquarium, a "$40 million, state-of-the-art, 87,000 square-foot aquarium experience," located at Broadway at the Beach in Myrtle Beach, South Carolina. Once my daughter heard about their special Babies exhibit, she was all excited. So we made the 40-minute trip down US-17. The aquarium is truly packed with fascinating sea creatures, educational videos, and hands-on experiences, which made it a great place for a family group, since no-one's going to be bored. The design of Ripley's aquarium is on a truly grand scale, huge tanks and many special exhibits and themes all surrounding a clever interior playground, with the slides cleverly disguised as giant sea creatures. The kids were having a blast sliding through the deep-sea fish, no doubt well-energized by the "space aged ice cream" for sale there! My favorite part of the visit was our trip "through" Dangerous Reef, a 750,000 gallon tank, during which we were able to see sharks and manta-rays from underneath, and wave "hello" to a very large sea turtle. The Octopi (or is it Octopuses?) were a little shy while we were there, but the Weedy Sea Dragons seemed curious. And of couse, there was also a very well-done touch tank, complete with Horseshoe crabs (very strange creatures); but we really enjoyed "Ray Bay," where we got the opportunity to touch many, many different kinds of Rays (Atlantic Rays, Southern Rays, Cow-Nose Rays, and Spotted Eagle Rays, to name a few.) When we were all satisfied we had managed to cover it all, we left . . . a little soggy perhaps, but happy. As I mentioned earlier, Ripley's aquarium is located right on Broadway at the Beach, which is an extravaganza of shopping, dining, attractions - about 350 acres' worth, to be exact. (In fact, large as it was, the aquarium is only one of dozen different attractions there.) This was good, because we left the aquarium very hungry, and to say that we had our choice of many different restaurants would be an understatement. I won't try to list them all here, as their website below does that. The prevailing craving was for some old-time burgers and fries at Johnny Rocket's (flawless "shiney-diner" decor); but we were truly spoiled for choice. 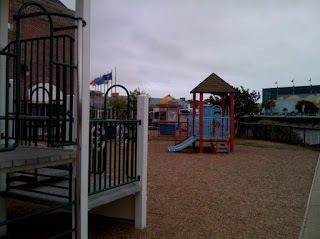 Afterwards, there was shopping, shopping, and more shopping - and, much to the relief of a great many toddlers, a lovely little gated playground by the water, which were dotted with several families of baby ducks. Broadway at the Beach is close enough so that your visit doesn't have to be a day trip; but there is so much there, you really need a whole day - or more. 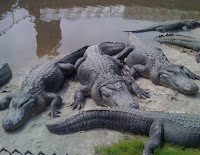 If you're looking for a fun place out of the sun (or rain) to go with small children during your visit to Sunset Beach, nearby Ocean Isle has a very nice natural history museum. Despite is smaller size, the Museum of Coastal Carolina has a lot to offer to its visitors - and most particularly to families with children. 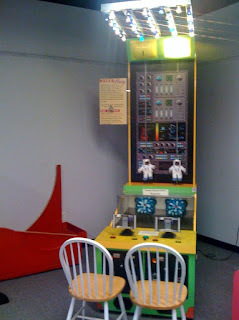 Amongst its plentiful displays of ocean-related artifacts and exhibits, there are lots of hands-on activities thoughtfully provided throughout the various display rooms, to keep the younger members of your party richly entertained during the course of your visit. 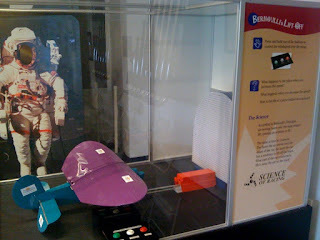 Also the native American and Civil War artifacts on display add yet another dimension to your appreciation of the area. When our family visited during latest beach trip, my 5 year old spent a very long time observing the many different creatures the museum's touch tank and peppering the very patient docent who was there at the time with question after question. Next, we passed through an rather elaborate walk-through display of a coastal habitat, while the kids pointed out the various life-sized creatures modeled there and ran around with their own newly-created jellyfish and seahorses made from the simple kits thoughtfully left out on low craft tables set up throughout the museum. 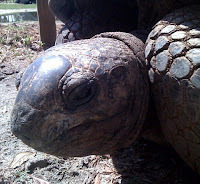 A walk through the aviary to watch the birds, plus a viewing of their collection of non-venomous live snakes, rounded out our lesson on the region's natural features admirably. We ran out of time before we ran out of museum, and so we plan to re-visit it on our next trip. Tucked away from the crowds and often exhausting size of other more well-known museums and aquariums, the Museum of Coastal Carolina is a reasonably-priced and reasonably-sized place to go for a few hours of quiet fun. It is also possible to save a little extra on admission to its sister facility, the Ingram Planetarium in neighboring Sunset Beach, when you buy a combination pass for both. Restaurants, Restaurants, & more Restaurants . . . Oooh! Ice Cream! Being just ten minutes down the road from all the fine seafood that Calabash, NC, has to offer is just one of many advantages we discovered after finding our place in Sunset Beach. In the past few months, we have started on our task of trying out the local food with gusto; and the job has been a very pleasurable one. Below is just a few of the very many choices in dining out that our area enjoys. There are tons more really nice places we've tried, and as time goes on, I hope to tell you all about them in this blog. But in the meantime, we've done our best to include menus for all in our guest book at the condo. OK, this place has obviously been a fixture in the town of Calabash for quite awhile. It has pedigree. It also has THE BEST cocktail sauce we have ever tasted. Do yourself a favor and buy a bottle on your way out. Also, for those who love all kinds of seafood, order the steam pot and plan to share. You will need to, as your portion of shrimp, crab legs, and shellfish will be so generous and so perfectly cooked that you will suffer pangs of regret for every morsel you are forced to leave behind. 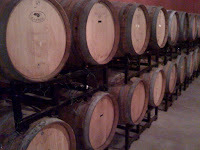 In Calabash, they have got the gourmet going on at the Grapevine! If you try nothing else, get their Greek-style marinated chicken breast. (My mouth's watering, just thinking of it.) You can get Calabash-style seafood there, but where they really shine is their Italian pasta dishes and Greek-inspired creations. Cute little diner-style place where you can get an excellent breakfast, with hot southern-style biscuits, and generously proportioned pancakes. To grab a quick and tasty sandwich or burger for lunch, they are a good place to go. They are small, which means your food is hot and care is taken w/ your meal; but the number of tables is limited and they can fill up fast. Of course, you cannot leave the area without treating yourself to a meal at the Boundary House (named after the original "boundary house" built on the state line in the early 1700's). Walking in, the building and decor alone is a feast for they eyes. But their food will keep you coming back. Anything on the menu is going to be fresh and fantastic and their desserts are made in-house. They handle seating and serving large groups with aplomb; and combine a casual atmosphere with upscale service. It just wouldn't be Summer without the joys of Ice Cream. Just 10 minutes down the road from us, their crisp white building with wrap-around porch and 2 cow statues out front ("Scoop" and "Dip"), is hard to miss. Be warned: Every kid in your car will suddenly explode into a frenzy of pointing and entreaties to stop for ice cream. This is one of those times when we must defer to the wisdom of children. With more than 24 gourmet flavors available throughout the year, multiple visits to the Creamery are . . . well, necessary for a happy and fulfilling life (Just my opinion.) They also have "no sugar added" flavors and pretty good coffee, so that no one in your group will be left out of the fun. If you're after a quick breakfast or lunch, and you love your coffee and your bagels, this little place just down the road from our neighborhood is a good bet. The bagels are fresh and they are not stingy with the fillings either. Gourmet coffee is available, and while you munch on your delicious bagel creation, you can gaze at the amusing depictions of bagels golfing all over the walls. We love it there! Anyway, there's more. I've still got to cover that nice little Irish Pub over towards the Beach, the excellent family Pancake House next to the gift shops, and . . . well, stay tuned. Our family discovered Sunset Beach, NC, late in the Summer of 2008 and spent several months after that first encounter, searching for a little place nearby so we could enjoy it again and again . . . and perhaps make it our permanent home once we retire. So now we have a little place in Sunset Village at Sandpiper Bay, surrounded by lagoons and pristine golfing greens, with only 5 miles of easy driving between us and that lovely beach! We have wanted a vacation condo on the North Carolina coast for many years, and with the addition of our lovely little daughter, a desire for a home away from home for our vacations grew stronger. And one year we decided to make the leap and started the process of choosing our beach. After months of visiting one NC beach after another, we eventually got to Sunset and fell in love. Yes, the phrase "unspoiled beauty" may be overused; but it's such an appropriate way to describe Sunset Beach, I'll risk putting it here. The beach is broad and flat, and when the tide was out that afternoon, we saw it left behind shallow wading pools of warm water all along the surf line, which were perfect for Moms and Dads to sit with their little babies to play. With all the houses and other development tucked neatly and well back behind the sand dunes, the views up and down this coastline were innocent of all the big, blocky condominium buildings and other development that clutter the view at the busier, more well-known Southern beaches. And although it was hardly deserted on that fine Summer day and it did take a few minutes to find a free parking spot, it didn't feel crowded. Once we stepped out onto the warm sand, we saw that there was elbow room, there was quiet, there was peace and relaxation . . . during high season! Another happy discovery was the golfing community of Sunset Village at Sandpiper Bay, a lovely little collection of villas tucked away behind the manicured grounds and shady lagoons of the Sandpiper Bay Golf and Country Club. The 3BR/2BA condo that we chose is light and airy, with a peaceful view over the water, right by a decorative fountain. We discovered that our 3rd-floor balcony provides an excellent vantage point for observing White Egrets fishing at the edge of the water, and the neighborhood is well laid out for a leisurely walk to the Club or an easy bike ride down its quiet streets. With all this in the village-like atmosphere of Sunset Beach, with excellent dining, entertainment and shopping of Calabash and N. Myrtle Beach just a short drive away, we feel extremely lucky to have a vacation home here. We hope to use this blog to share all our discoveries about Sunset Beach and its nearby attractions.